Walking Liberty Half Dollar: Historic Coin Value Trends of this Awesome Series. This is page one of the historic value trends for individual coins of the Walking Liberty Half Dollar series. Price movements from 1950 to the present for each Walking Liberty coin are reported. The tables are organized to help coin collectors find Walking Liberty half dollar value trends which have marched ever higher over a long period of time. The links below are designed so that those of us who admire Walker Halves can readily zero in on specific dates of interest. There is one table for each and every date, covering a range of grades. The rarest dates of the Walking Liberty Half Dollar series are the 1916, 1916-S, 1917-D and 1917-S (both having mintmark on obverse), all 1921 issues (P, D, and S), and the 1938-D. Small wonder, then, that these dates have the strongest record of value growth of the entire "Walker" group. The Walking Liberty Half Dollar is much more than just numbers and percentages. We encourage collectors to learn more about the origin of this popular coin by visiting the Walking Liberty Half Dollar introductory page. You will find value trend online reports for other US coin types by going to the Coin Value Tables online listing page. You can also see the list of available reports by clicking the "Get Historic US Coin Values" at the upper right hand corner of this page. See important note below for explanation of grading standards. In the 1950s, grading practices were radically different from what we have today. A coin's condition was described using simple adjectives such as "Very Good" or "Uncirculated". Accordingly, numismatic references of those times conformed to the same set of adjectives to approximate retail coin values. Varying distinctions of Uncirculated (today's equivalent of MS-60, MS-61, etc) and Proof were recognized in some advertisements and auction bills by employing modifying descriptors such as "Brilliant Uncirculated" or "Choice Proof", for example. However, with no clear point of reference or consistency on how the modifying descriptors were invoked, most publishers resorted to listing values for only one "Uncirculated" grade and one "Proof" grade. The 70-point numeric system (G-4, VG-8, etc.) in widespread use today was popularized by the American Numismatic Association in the late 1970s, an era when coin values were escalating dramatically, most notably for high quality specimens. Vague descriptors such as "Choice" and "Brilliant" were replaced by more precise numerically determined grades. Thus, finely differentiated grades like MS-60, MS-63, and MS-65 became commonplace, and by the late 1980s, the practice of assigning a numerical grade to indicate quality was universal (this does not imply the 70-point system eliminated grading inconsistencies, but it did help to stabilize the coin collecting hobby). In February 1986, the ANA changed its grading interpretations to match the tightening standards demanded by the marketplace. This meant that many coins correctly graded as MS-65 in the early 1980s became MS-63 or less, so as to be consistent with the newly revised interpretation. Conversely, a coin graded after 1986 as MS-63 was about equal in quality to an MS-65 before 1986. Thus, the Mint State prices published in numismatic periodicals prior to 1986 are not directly comparable to those published later. The Coin Value Tables of this website relied heavily on periodicals from before 1986, but we did not attempt to compensate for the revised grading standards of 1986; we reported what we found. One must take this into account when studying trends for an MS-65 coin from, say, 1980 to the present. On the other hand, because of the dearth of Mint State price estimates published prior to 1986, more than 98% of the Coin Value Table data is not affected by anything mentioned in this paragraph! 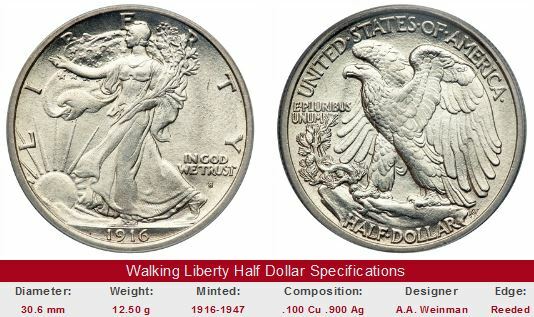 The Coin Value Tables trend data for Walking Liberty half dollars reflect the historic availability of numeric grades. For the 1950-1985 rows, the values in the "G-4" column correspond to the "Good" listing of those years, "VG-8" corresponds to "Very Good", and so on. The "MS-60" column records the "Uncirculated" value reported during those same decades. Starting in the 1980 row, "Uncirculated" grades are broken down into MS-60 and MS-65 designations. Later years indicate an even wider range of "Uncirculated" grades, as data became more available. For those interested, we have a coin grading section with more details on the evolution of grading coins.